Each Globe is hand-carved from a specially selected Himalayan Salt boulder, then shaped and rounded into a sphere. Comes with UL listed cord and bulb assembly, weighs 7-10 lbs and stands 7-8″ tall. Himalayan Salt Spheres are negative ion generators. These spherical natural salt crystal lamps can create a cleaner, fresher quality air, reducing airborne pollution, smoke and dust. Negative ions are emitted by waterfalls and thunderstorms. Now you can bring the power of this natural phenomenon indoors. 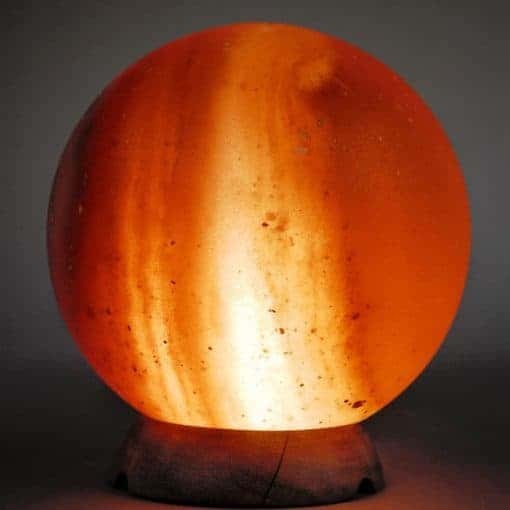 From a rough beginning as a large, specially selected Himalayan Salt Boulder each sphere is hand-carved, shaped and rounded. The combination of this smoothly surfaced bowl and the clear brilliance of the salt is inspiring. Your salt sphere lamps take several days to create. Comes with UL listed cord and bulb assembly weighs 6-8 lbs and stands 7-8″ tall, Get it today!